Tips on nutrition – training – motivation – fitness – performance and competition. This exclusive new training DVD runs approximately 100 minutes. Gina is a Pro Figure champion and the information contained is applicable to every woman who lifts weights, or wants to improve and sculpt her shape and physique. 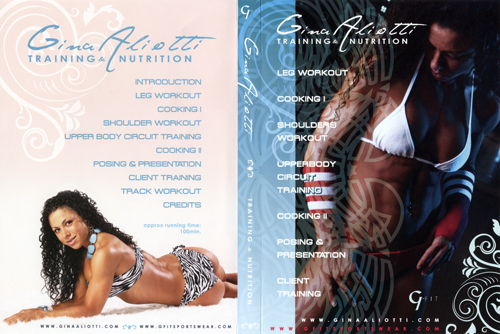 The DVD includes all aspects of weight training, one-on-one client training, healthy cooking and diet advice, posing and presentation plus a track workout. Watch Gina train her amazing legs, shoulders and perform a pre-contest upper body circuit as she prepares for one of the biggest shows of the year, The Arnold Classic Figure International. Please click here to see Gina winning this contest in 2008 in our DVD which is GMV-695DVDSP. See also our 2009 Figure International DVD. Whether in the gym, at the track or in the kitchen, learn how Gina does what she does and sculpts her body into one of the top IFBB Figure Professionals on the scene today. See how Gina performs some of her favourite exercises and learn how she has become the young Figure Professional Champion she is today.